HomeBlog postsGuttersWheaton Siding and Gutter Look Amazing After Replacement! Wheaton Siding and Gutter Look Amazing After Replacement! A Wheaton customer, Richard, called us to come to his home to look at his siding. He hadn’t noticed it before, but the siding was coming undone around the windows. It is a good thing that he called us when he did. The siding was coming down because the guttering system wasn’t draining properly and causing damage to the wood under the siding. If this problem wasn’t repaired quickly he was looking at thousands of dollars in damage. We gave Richard our bid, and he wanted us to start work immediately. We arrived the next morning, bright and early and began replacing the guttering system. We removed the current guttering and replaced it with the Leaf Relief guttering system. 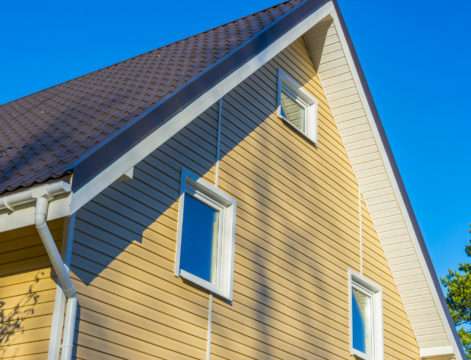 We removed the siding and replaced the wood, then applied new siding on the whole house, as the customer wanted a new look and an energy-efficient siding. We completed the project in just a few days he sent us a letter. He said he was never so happy with the finished project. He said his home looks amazing, and all the neighbors were complimenting him. He told his neighbors that Berg Home Improvements did the project and we were professional, prompt, and better yet, affordable. Berg Home Improvements would like to thank you for your wonderful comments and for trusting us with your home. We take pride in providing outstanding work. It is customers like you that makes us the #1 roofing and home improvement company in Wheaton. If you ever need roofing, windows or other home improvements done, don’t hesitate to call us. We are available anytime for emergencies as well. For more information on Wheaton’s leading home improvement company, click here! Please call us to discuss your upcoming projects. Please fill out form below to inquire about our services. Disclaimer : The information on this website is for informational purposes only; it is deemed accurate but not guaranteed. It does not constitute professional advice. Testimonials are not a guarantee, warranty or prediction of what your experience with us will be. By providing certain contact information herein, you are expressly authorizing the recipient of this message to contact you via the methods of communication provided.